When you're picking out a hamster house, the plethora of choices can make you dizzy. A glass aquarium set-up is pretty nice digs for your hamster pal. Sturdy and chew-proof, a glass aquarium often will last longer than plastic alternatives. While your little pal is small, that doesn't mean a tiny 5 gallon tank will do. His tank should be at least 2 feet long and 1 foot wide. This means he should have at least a 20 gallon tank. You can purchase fish tanks without lids or any other fish accessories at your pet store. Length is more important than height. The longer the tank the more room he'll have to run around. A glass aquarium lid will not work when using an aquarium as a hamster home. Opt for a tight-fitting wire mesh lid. A mesh lid will allow for more ventilation while making it difficult for Hammie to escape. 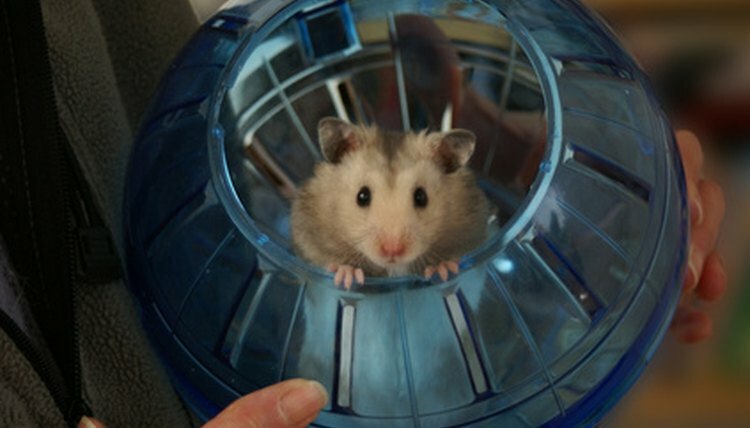 A lid that doesn't allow for ventilation will make the cage too humid for your hamster's preference for an arid environment; hamsters are desert creatures. You'll have to clean the tank weekly to keep smells from building up, since glass won't breath as well as wire. Since he won't be able to climb on the bars of his cage or run through a maze of attached tubing, you'll need to provide him with plenty of toys for playtime. Give him a hamster wheel to get him exercise, and make sure his tank is large enough to accommodate it. Toss in paper towel tubes or wooden chew-sticks to give him something to entertain himself, since a glass tank could get boring for him. Take him out for daily play and exercise. Glass can make it tricky to secure a traditional hamster water bottle. Choose a bottle with a long hanger that he can reach when hung from the edge or secure it to the tank with sticky-backed Velcro. Make sure to keep your hamster home in a cool place away from the sun or his glass cage will turn into an oven. Glass aquariums can be more expensive than wire or plastic alternatives, but are more hamster-proof so they should last longer, making it worth the investment. They also can be very heavy and might break if dropped, so use care when carrying his cage. If you want to provide a little more space for your hamster to play, an aquarium/wire cage hybrid is another option. These wire cages attach to the top of an aquarium in place of a lid and give Hammie another story to explore. Provide him with a ramp to be able to access the cage. This provides him with wire to climb on as well as an easy place to secure his water bottle. Since the bottom is an aquarium, it will keep bedding from getting kicked out all over the floor, while still offering the ventilation of a wire cage. Choosing a cage hybrid gives your pal the best of both worlds.